At Spring Creek Resort there is a restaurant, tavern and lots of trees. Peaceful and quiet in the great outdoors. 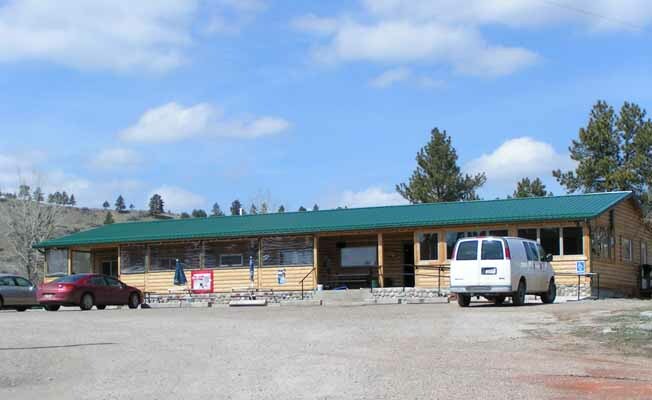 The park is located in the foothills of the Wolf Mountains and sits on 10 treed acres with 25 RV spaces with lots of wildlife in the area. The wildlife consists of deer, elk, pronghorn, coyotes, bear, wolf, cougar and upland birds that bring a lot of hunters into the area. Hunters use us for their meeting place and a place to eat. The Custer Battlefield and the Bighorn River are nearby which has some of the best fly fishing in the country. There is a bar, restaurant and C-store with a USPS Village Post Office. Dining customers can view wildlife while dining and may even see a wolf. There is a laundry/bath house with new washing machines and dryers. Spring Creek Resort from I-90 Exit 497, 25 miles east on Highway 384, from I-94 Exit 72, 33 miles west.Spring Creek Resort from I-90 Exit 497, 25 miles east on Highway 384, from I-94 Exit 72, 33 miles west.